Crossfire announces itself as a film about racism. A police drama about a man who tries to evade a charge of murder by implicating something else- it eventually comes down to a discussion of who might have a motive to kill the victim. The policeman in charge of the case decides that the only motive within the case is a general one- anti-semitism- and suggests that none of the suspects actually knew the murdered man. He turns out to be right. 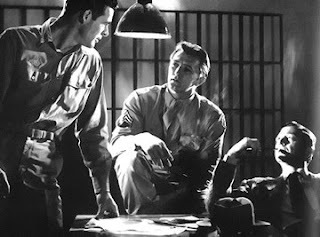 Crossfire in a sense therefore is a pretty simple film and as a police drama it does not quite work- the acting is good, both Robert Mitchum and Robert Ryan do well and Gloria Graham confirms my prejudice that Gloria Graham was one of Hollywood's best underused actresses of all time. Yet again she has a tiny amount of screen time and yet again she makes the most of what she has. The story though is too simple and slow to really make you feel intrigued by the 'thriller' aspect: from the start you can easily guess the murderer, from the start you feel confident that Mitchum's laconic sergeant and Robert Young's intelligent if cynical police officer will solve the case. The suspense just is not there. There are three things though which make the film worth remembering. All of them relate to the dialogue of the characters. The first is a set of ideas, the second a historical circumstance, the third is a set of motifs which until now I feel have been ignored. Lets start with the ideas. The reason the film has survived is because of its analysis, in particular Robert Young's analysis as Captain Finlay, of prejudice. Prejudice says Young starts as a decision to exclude a race from country clubs or to say that your daughter shouldn't marry a Jew or an Irishman or an immigrant, and it ends in a man walking around to someone's house after he has had a few drinks in a bar and beating the other fellow to death because he doesn't want to share another drink with him. What Young does and the film seeks to do is provide the bridge between different types of prejudice and explain why and how the space for one allows another more murderous prejudice to thrive. Murder in this film is seen as an unconscious consequence of prejudice- it is not something anyone intends- but filled with hate and passion, a violent attack swiftly turns into murder. Prejudice is harmless or if not harmless, not murderous for most, but for some including one character it can easily turn into murder. Secondly this is one of the few films made in Hollywood in the late forties that is explicitly post war. Almost every major character has served in the army and their service has consequences for them. As Robert Mitchum's character says it has exposed them all to the kind of killing 'for which you get medals', that kind of killing impacts on these men in different ways. It has helped Robert Ryan's character to hate: hatred as another man in the film says must be turned in another direction now the enemy is defeated and curiously for Ryan, it means that he can turn his bitterness on civilians but also ironically on Jews (the victims of the regime he was fighting). Mitchell, another key character, comes out of the war with chronic depression: wandering listlessly across Washington, missing his wife, and straying through drunkenness and tears into sadness and disaster. He evokes pity in most of the characters he comes across, but 'good old Mitch' is as much a victim of the war as anyone else. 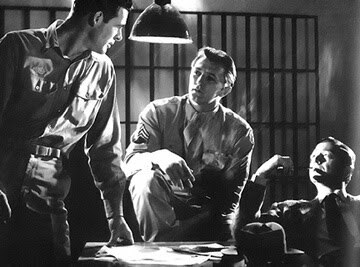 His character brings up a third aspect of the war, removal from wives and families- Mitchall longs for his, Robert Mitchum's character just feels cut off from his and from his previous life. If the one feels deadened by the absense of family and his presence in the army, the other looks back on his old life as something that has died. Mitchall wonders through the city and at one point encounters Gloria Graham in a bar- she takes pity on him, dances with him and kisses him, telling him to go back to her flat and wait for her there. Whilst in Graham's flat, Mitchall encounters possibly the most mysterious character of them all: he might be Graham's husband, her boyfriend or her pimp, or he might be all three but we never find out. He delivers two monologues to Mitchall that I think are inspired- they are almost Pinteresque, both in the menace conveyed by ordinary sounding words and in the use of pauses as he finds a new story to intimidate both us and Mitchall. He ends up seeming rather pathetic as he offers to help the police again and again, but in those two little speeches last only about five minutes, I think there is something that later film makers and playwrights would and could take advantage of. Crossfire is not a great film- it does not succeed in its main task as a suspense thriller but it does succeed in other ways. It has a message element, it reflects a historical situation and it provides a rather intriguing enigmatic character: these don't add up to a good film but they do add up to a historically significant film.